Today marks the fifth anniversary of the massacre of the Nuristan Eye Camp team in northeastern Afghanistan. It was the deadliest attack on aid workers in Afghanistan in recent history. Among the ten who were killed was a dear friend, Cheryl Beckett. Cheryl was a brave, gifted, prayerful woman full of “love and good works”; and even in the midst of many years of hard ministry in a war zone, she kept her good sense of humor. 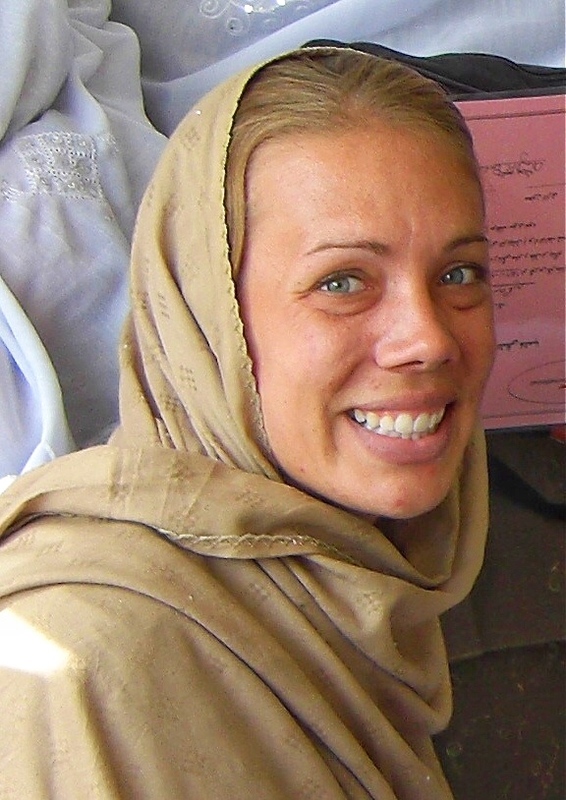 By her life and by her death, Cheryl put Calvary Love on display for the Afghan people. As a tribute to her, here are my journal entries from 2010 reflecting later on Cheryl’s death and that of the other brave men and women of the Nuristan team. Bright leaves are hanging on for dear life as an autumn wind tugs at them and tousles the green outfield. A faded scoreboard stares blankly, waiting for another baseball season. Soon it will be capped with snow and fringed with icicles, but for now the sun is absolutely brilliant and it feels like the last day of summer. Arrived in Ashtabula a bit early and am waiting at this deserted baseball diamond. I have my choice of bleacher seats as I wait for Chris and Joe, pastors over in nearby Madison, where I’ll preach tonight. They’re delayed a bit, so it gives me time for coffee and a breather after two days on the road. Ashtabula is the site of the infamous train wreck which claimed the life of the great hymn writer Philip Bliss. I’m too close in my travels not to see it, so that’s why I am here. Both Chris and Joe, besides pastoring, are themselves hymn writers and composers—five-talent men who are ever busy about their Master’s business. They’ve agreed to show me the site of the 1876 train disaster. I want to see it, for Bliss has been a blessing to me for as long as I’ve known how to sing. I’ll never forget that first Easter sunrise service and its opening praises, and I can never get away from that pause between the grave and glory. It is the place of unanswered questions, and I’ve had a lot of those lately. I got a call from Afghanistan early one morning in August and learned that my friend Cheryl Beckett had been killed, along with nine other aid workers. They were ambushed by Islamic militants. I can’t allow myself to even think about how she died. She was a beautiful soul who never failed to lift my spirits with her joy in Christ. Our time together in June was precious—although at the time, I didn’t know just how precious. I don’t expect a good answer to why at thirty-two years of age she should be taken. She brought so much strength to the team, and she put Calvary Love on display for the Afghan people to see. There are already so few there, so few willing to go there. It still hurts to write about her. Staying a couple of miles from Lake Erie. The house is quiet, and sleep beckons, but this has been a day to remember. Took a walk with Chris and Joe up from the ball field to the old trestle, where long ago Bliss and his wife lost their lives, along with nearly a hundred others. We walked through autumn splendor. Leaves, which screened the westering sun, looked like stained glass set in a cathedral of trees that scattered colorful confetti in our way. As we walked, Joe told us about Bliss, who was one of the most popular and influential musicians of his time. Bliss coined the term “Gospel song,” and his partnership with D. L. Moody and fellow hymn writer Ira Sankey spread his ministry to both sides of the Atlantic. Just before Christmas 1876, D. L. Moody was preaching in Chicago to thousands daily. At that time Bliss was engaged in evangelistic meetings in the Midwest, but Moody asked him to come to Chicago and help. Bliss returned home to Pennsylvania to spend Christmas with his family, and then he and Lucy left their young sons in the care of Bliss’s mother and sister and set out for Chicago. The evening of December 29, the train pushed through northeastern Ohio in a blizzard. As it crossed the Ashtabula River, the trestle cracked and gave way, plunging all the passenger cars seventy feet down into the river. Kerosene stoves inside the wooden rail cars spread fire rapidly through the crash. Philip and Lucy died along with 92 others, their remains completely consumed by the fire. Bliss was 38 years old. We stood near that rebuilt trestle. The river mirrored nothing but a peaceful afternoon. The sound of a passing train was the only reminder of the carnage that once lay here. So we sang Bliss’s tunes, It is Well with my Soul and Hallelujah! What a Saviour. Joe told me that Bliss had sent his luggage to Chicago ahead of them, and his suitcases arrived before the news of his death. A friend opened the luggage and found the lines of a new hymn Bliss was working on. So on I go not knowing . . . I’d rather walk in the dark with God—I was stunned. I immediately thought of Cheryl Beckett’s last letter to us this summer. She included this poem. No, not quite true. I wish it were. All I can say, in honesty is this. He being dead, she being dead, “yet speaketh” (Heb. 11:4). Bliss and Beckett, they’re both reminding me that Christ has not promised answers to all our sorrows. All He has ever really promised is His Presence—and that is enough. * Philip P. Bliss, “Hallelujah! What a Savior!” (pub. 1875, Public Domain). ** Mary G. Brainard, arr. by Philip P. Bliss, “He Knows”, (pub. 1876, Public Domain). ** Eddie Askew, “I See Your Hands.” Many Voices, One Voice, (The Leprosy Mission International, 1985) 39.